Scottish government baby boxes – more information, more concerns | The Nation said No Thanks! ← YesM8? NoM8 – don’t touch it with a barge pole! This post is in two parts. I drafted Part 1 a while ago after the Scottish government (quietly) released the full certification they hold for the box. I decided to hold off publishing it as I thought there was little else they were likely to concede. Today’s Guardian newspaper has further damaging information on the boxes so I have added a Part 2 about that. The identical wording (including the error that the box complies with ‘BSEN11330’ – it’s actually ‘BS EN 1130’) was an eerie echo of the earlier coincidence noted at the beginning of the previous post, of an SNP MP and councillor tweeting identical praise for the pilot version of the box. Ms Freeman bothers me not. She’s the minister for social security, has no responsibility for the baby box and blocked me a long time ago on Twitter. Her tweet was merely a copycat of Ms Todd’s. Maree Todd is more interesting because she is the minister for childcare and early years. She attached some photos to her tweet (here) and in an exchange with someone else invited them to e-mail her if they had any further questions. On the back of that offer I decided to ask her if, as the still fairly new minister for the baby box scheme, she was able to make publicly available a copy of the BS EN certificate for the box together with the associated test results. At this point, regular readers, not to mention the occasional nationalist who claims this blog is only ever about ‘SNP bad’, may wish to pause for breath because (a) she replied and (b) I give her unqualified praise for her openness. 15 Jan at 2:45 p.m. Thank you for your e-mail of 4 January 2018 regarding Scotland’s Baby Box’s safety certification. We have previously been unable to release the BS EN Certification for Scotland’s Baby Box as our managing agent for the programme, APS Group (Scotland) had wished to protect the Intellectual Property (IP) of their box supplier who are a UK based SME. We are now approaching the tender for year 2 baby boxes and contents and to avoid this situation arising again in year 2, I have asked that the accreditation be a mandatory part of the box specification. Accordingly, we have agreed with APS Group (Scotland) and their supplier to make the certification publicly available. I have therefore attached the BS EN Certification for Scotland’s Baby Boxes. You will note that materials were not tested as part of this process due to the materials holding their own certification. For completeness I also attach the relevant paperwork for the materials, board and ink, used in the production of the current baby box. I hope this reassures you that Scotland’s Baby Boxes have been awarded with British Safety Standard BS EN:1130 accreditation as a crib for domestic use. A sceptic may say that Ms Todd could see which way the wind was blowing and, to mix my metaphors, was trying to lance the boil of criticism about the safety of the box. Never mind. It’s done and it’s something the civil servants wouldn’t do when responding to my previous three Freedom of Information (FOI) requests on the subject. The government have now placed the documents concerned on their Parent Club web site (scroll down and open the section on ‘Does Scotland’s baby box meet industry safety standards?’). Parts of each document have been redacted but I’m as sure as I can be that they are of no significance in this context. 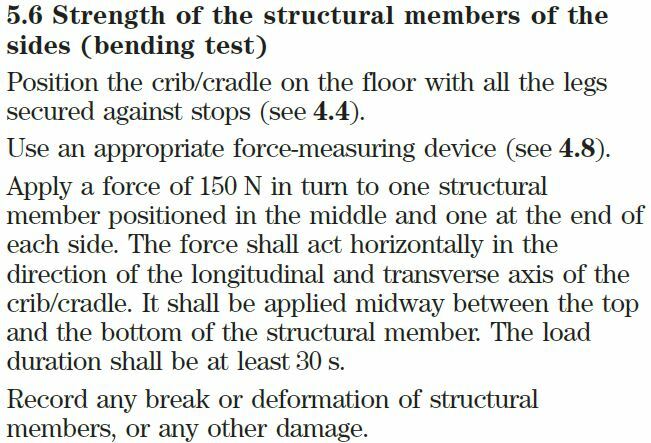 The second and third items refer to separate standards, not to BS EN 1130-1:1997.
meets all aspects of the standard applicable to it [BS EN 1130-1:1997]. (Excluding clause 4.1 Materials at request of client). 5.8 Vertical static load test. 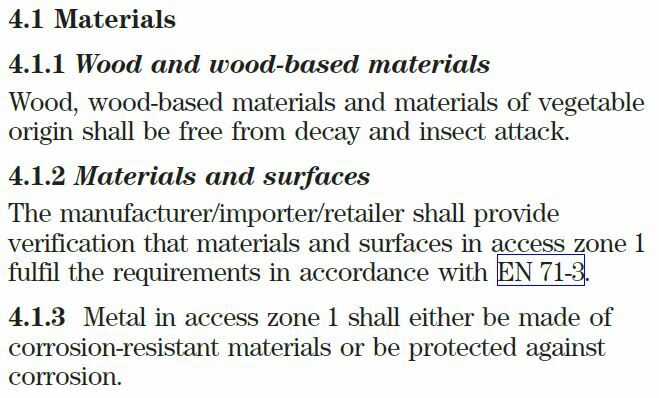 The conundrum is how can you exclude testing of materials – cardboard – from the standard and then undertake, let alone pass, tests intended for wood or metal? BS EN 71-3:2013+A1:2017 Safety of toys. Migration of certain elements. So in BS EN 71-3 etc. we have standards not for ‘Furniture. Cribs and cradles for domestic use’ but for toys and the packaging in which toys come. Whether this is sufficient for a box in which a baby is intended to sleep is at best a moot point. Finally, two further potential safety issues about the boxes have become apparent to me. Doubts were raised about the safety of the holds on the commercial version. Because there are slots/handle holds on the sides, the box was likely to be used as a carry cot which was not its intended or safe use. In particular, the edges of the handle holds could be sharp, there was a small risk of the laminate coating on the box being pulled off at the handle point which could represent a suffocation hazard, limbs could be trapped from the handle holds, and the box could be unstable. If you follow the link, you’ll see that the company both identified and resolved these problems. Whether or not any are relevant to the government’s boxes I don’t know. But it would be helpful to have a reassurance that they’re not. there is no safety standard in existence anywhere in the world that specifically applies to a baby box as a sleeping place for a baby. Be aware that some manufacturers state that their boxes meet European Union 1130 standard for cots, cribs and bassinets. While some elements of a cardboard box may comply with this standard, for example, wood material, structure and smooth edges, remember that EU 1130 is a furniture standard for traditional cots, cribs and bassinets. I had not written a conclusion to what is now Part 1 of this post when I decided to defer publishing it (see introduction). Today, the Guardian newspaper has an article entitled Cot death expert raises concerns over Scotland’s cardboard baby boxes. All credit to them for the new information they have unearthed. I’d urge you to read their article but meantime here is a summary of its key points that relate to the concerns I have previously expressed. there was no evidence they [baby boxes] were safe or reduced cot deaths, and urged them to stop claiming they are a safe sleeping space except in rare cases or emergencies. The Guardian also claims that when he raised these concerns at a monitoring meeting, the minutes of the meeting did not accurately set out his concerns until he asked for them to be included. A cynic might say ‘The Scottish government and the minutes of meetings. Where have I heard about that before?’ He wants the guidance and information given with the boxes to be changed and concedes ‘I think [the government] are listening’. Mind you, this is fifteen months after the baby box pilot programme started so the listening can’t have been as assiduous as it might have been. accreditation had not been available for the boxes in the UK. It was only now starting work on designing that accreditation. ‘At present there is no standard that covers baby boxes. There may be some clauses of the BS EN 1130 furniture, cribs and cradles for domestic use series that could be applicable to baby boxes, but BS EN 1130 is a furniture standard and not intended for cardboard baby boxes’. This confirms the doubts I expressed in my previous post about the partial testing of the box, the granting of ‘accreditation’ on that basis, and the marking, literally, of the box with ‘BSEN1130-1:1997’. These are the essential point from the Guardian article although, as I say, I’d urge you to read it to appreciate the full detail of what it claims. I had thought, previously, that controversy surrounding the government’s baby boxes might fade away after the inept introduction (from a safety point of view) of the scheme. I’m not so sure now. My thanks, as before, to various people who helped with information and comment for this post. Following hostile comment on Twitter from people who had either not read or understood the previous post on the subject I will not be discussing this one there, but feel free to post comments here. Usual rules apply. This entry was posted in Uncategorized and tagged baby box, facts, news, Scottish government, SNP. Bookmark the permalink. My son thought his 3 month old baby had a fever after using thermometer provided in the box and was concerned and gave Calpol. When we tried out the thermometer on ourselves we all registered as having high temperature. Quite concerning as could cause needless anxiety and unnecessary medication. Useless if not accurate. That’s bad. I hope he felt able to report it to the health visitor or GP. Scottish govt ie SNP have brought this criticism on themselves- if they’d been open, honest and upfront about the Babybox’s limitations at the start instead of trying to make themselves saviours is Scotland’s babies, none of this furore would have happened. Debate about universal provision and best use of public funds would however still remain. Well done for uncovering their attempts to fool the public and ignore advice from experts.